JEST BECAUSE IT'S JUNE: Broadway Angel, a division of Angel Records, will release the 1994 Broadway cast album of CAROUSEL in June, produced in Dolby Surround Sound and THX, featuring the talents of Michael Hayden (Billy Bigelow), Sally Murphy (Julie Jordan), Audra Ann McDonald (Carrie Pipperidge), Eddie Korbich (Mister Snow), Fisher Stevens (Jigger Craigin) and Shirley Verrett (Nettie Fowler) under the musical direction of Eric Stern. The full digital recording, co-produced by Jay Landers and Tony McAnany, with liner notes and synopsis from Ethan Mordden, will be released in both single CD and audio cassette formats. 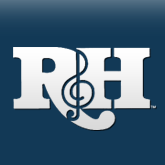 (For more news on R&H album releases, see "For the Record" at the end of this column). A LONG, LONG WAY TO RUN: The smash success of the current national tour of THE SOUND OF MUSIC starring Marie Osmond and Laurence Guittard, directed by James Hammerstein, has now extended its itinerary into the spring of 1995; Broadway is also a possibility. NEW THINGS COME, AND OLD THINGS GO: Livent Music recently released the original Canadian cast album of SHOW BOAT, featuring the stars of the current Toronto production: Robert Morse, Elaine Stritch, Rebecca Luker, Mark Jacoby, Lonette McKee and Michel Bell. While Morse continues in Toronto, his fellow stars will head down to New York later this summer, where they will be joined by John McMartin as Cap'n Andy for SHOW BOAT on Broadway; tickets are already on sale for the $8 million production directed by Harold Prince and choreographed by Susan Stroman, scheduled to open at the Gershwin Theatre on October 2. Meanwhile, when the Toronto production heads into its second year, Morse will welcome a new set of co-stars to Canada, including Cloris Leachman as Parthy, Patti Cohenour as Magnolia, Valarie Pettiford as Julie and Vivian Reed as Queenie. DON'T MISS IT, DON'T EVEN BE LATE: At their 75th Anniversary gala this spring, the Theatre Guild - original producers of OKLAHOMA!, CAROUSEL and ALLEGRO - announced plans to send out a national tour of Rodgers & Hammerstein's STATE FAIR, beginning in the summer of 1995. This stage version of the duo's 1945 Academy Award winning movie musical has been written by Tom Briggs and Louis Mattioli, and will be co-directed by James Hammerstein and Randy Skinner, with choreography by Skinner. A BRIGHT GOLDEN HAZE: Fox Video will issue a special Golden Anniversary release of six Rodgers & Hammerstein movie musicals for home video later this summer: OKLAHOMA!, CAROUSEL, STATE FAIR (1945), SOUTH PACIFIC, THE KING AND I and THE SOUND OF MUSIC, accompanied by audio cassettes of their motion picture sound-track albums. I COULD WRITE A BOOK: Max Wilk's entertaining account of the first Rodgers & Hammerstein musical, O.K.! - The Story of OKLAHOMA! currently available in hardback from Grove Press, is scheduled for paperback publication by Christmas 1994. Award-winning illustrator James Warhola has finished his second book for Simon & Schuster based on a Rodgers & Hammerstein song; his follow-up to The Surrey with the Fringe on Top (see Happy Talk, Autumn 1993) will be My Favorite Things, available in early fall 1994; Simon & Schuster will follow that with In My Own Little Corner, illustrated by Katherine Potter and published in 1995. The Billy Rose Theatre Collection of the New York Public Library for the Performing Arts is offering for sale copies of the book Letters to Dorothy, featuring correspondence from Richard Rodgers to his wife Dorothy written between 1926 and 1937, when he was out of town with such shows as ON YOUR TOES and BABES IN ARMS. All 250 copies of the limited edition are numbered, and signed by Dorothy Rodgers. For information contact Richard Buck at the Library, 212-870-1644. Mary Ellin Barrett has just completed a book about life with father; Irving Berlin: A Daughter's Memoir, will be published by Simon & Schuster in November - more on that in our next issue. ALL THE SOUNDS OF THE EARTH ARE LIKE MUSIC: CBS THIS MORNING continues to use its official theme song, "Oh, What a Beautiful Mornin'" to great success and now includes cameo renditions of the song as a rotating element of its daily line-up; earlier this spring "Mornin'" was performed by, among others, the Manhattan-based pop vocal group The Tonics (featuring R&H Music writer Lindy Robbins) and the cast of the Lincoln Center Theater production of CAROUSEL. WHAT I DID ON MY SUMMER VACATION: Williamson Music composer Ricky Ian Gordon's site specific work, STONEWALL, written with Tina Landau, was presented in Greenwich Village in mid June, and was followed in late June by his new choral work, THE ANGEL VOICES OF MEN, premiered by the New York Gay Men's Chorus at Carnegie Hall. Upcoming on July 18 in Bryant Park, New York City, is a concert of Gordon's work featuring soprano Angelina Reaux, and his first song folio, A HORSE WITH WINGS, is due out from Hal Leonard Publishing later this year. ROCKIN' ROBBINS: "Strangers Once Again" by R&H Music writer Lindy Robbins and John Bucchino was performed by Andrea Marcovicci at her recent SPRING SONG engagement at the Algonquin Hotel's Oak Room in New York City. Marcovicci plans to record "Strangers..." on NEW WORDS, her album for Cabaret Records coming out next winter. Three other Robbins songs appear on the recently-released debut album from Eric Michael Gillett on Elba Records: "Flying in Your Dreams," "Children of the Rainbow," and "Colors of the World". "FALLING IN LOVE" (AGAIN): The UB40 single of "Can't Help Falling In Love," represented by Williamson Music for Elvis Presley's ASCAP company, Gladys Music, was launched by the motion picture soundtrack for last summer's thriller SLIVER and stayed atop BILLBOARD's Hot 100 Singles chart for nearly two months. In May of this year UB40 received ASCAP's Pop Music Award which cited "Can't Help Falling in Love" as one of the most performed songs of the year. AIMP (Association of Independent Music Publishers), in its first annual music award, also cited this version as Best Cover Song of the year. FOR THE RECORD: Lyle Lovett's new recording of Irving Berlin's "Blue Skies," featured in the Warner Bros. motion picture WITH HONORS starring Joe Pesci, can be heard on that movie's soundtrack album from Maverick Records. Cabaret artist David Staller has released a new album, Easy to Remember, devoted to the songs of Rodgers & Hart, from Cabaret Records. In May Andrea Marcovicci recorded her new Irving Berlin set, ALWAYS, IRVING BERLIN, live at the Oak Room in New York's Algonquin Hotel; the album, from Cabaret Records, will be out in the fall. Reporting on albums released in 1993, CD REVIEW said that the Rodgers & Hammerstein 50th Anniversary "prompted a flood of CD reissues that rivals Mozart's bicentennial celebration." The first year of the team's second half-century has also gotten off to a good start. 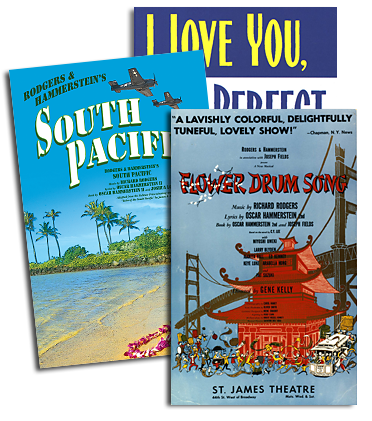 Currently available: the London cast album of CAROUSEL (released by First Night Records in the U.K. and RCA Victor in the U.S.), the Canadian cast album of SHOW BOAT (Livent Music), the first CD issues of the 1960 London cast album of FLOWER DRUM SONG (West End Angel) and the 1980 London revival of OKLAHOMA!, recorded live (TER Records), and CAPITOL SINGS RODGERS & HAMMERSTEIN, the latest in a series of compilation albums from Capitol (previous issues have saluted Irving Berlin, and Rodgers & Hart), featuring the talents of Bobby Darin ("Hello, Young Lovers"), Peggy Lee ("I Enjoy Being a Girl"), Tennessee Ernie Ford ("My Favorite Things"), Judy Garland ("You'll Never Walk Alone"), and more. R&H audiophiles can also look forward to the 1994 Broadway cast album of CAROUSEL (coming from Broadway Angel in June), the original Broadway cast album of A GRAND NIGHT FOR SINGING (Varese Sarabande, September) and Julie Andrews' new solo album, devoted to the songs of Richard Rodgers, with Ian Fraser conducting the 80-piece London Musicians Orchestra. The album, featuring "Thou Swell," "This Can't Be Love," "Bewitched," "If I Loved You," "Edelweiss," "Do I Hear a Waltz?" and more, will be released internationally by Philips Classics in the fall.